On 18th September 1879, Blackpool Illuminations were switched on for the first time. Here are ten illuminating facts about them. Blackpool Illuminations are 6 miles of electric lights and light displays which run along the promenade of Blackpool in Lancashire, England. 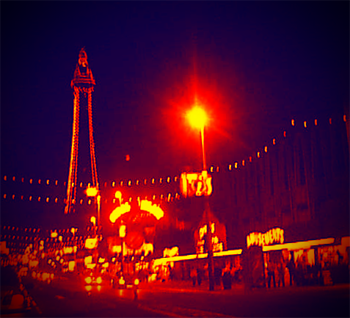 The first Blackpool Illuminations were in 1879 when 8 large electric arc lights were switched on and lit the promenade. The switching on of them drew thousands of people to Blackpool "to see the lights." In May 1912, Blackpool's promenade was decorated with 10,000 lights to celebrate the opening of a new part of the promenade. The new part was opened by Princess Louise and the event proved so successful that the lights were switched back on later that year. They returned the following year and have become an annual event ever since. The only years when there haven't been any illuminations in Blackpool were during the First and Second World Wars. After the Second World War, the illuminations returned to Blackpool in 1949. Nowadays, over 1 million light bulbs are used to illuminate Blackpool's seafront. Blackpool Illuminations shine for 66 days every Autumn, with the big switch-on occurring early to mid-September, and the switch-off happening in November. In 2015, they were switched on on 4th September and will remain lit until 8th November 2015. Every year since 1934, a famous person has turned on Blackpool Illuminations. Lord Derby (Edward Stanley) was the first in 1934 and most recently in 2015 the switch-on was done by movie director Tim Burton. Over the decades, the Illuminations have been switched on by the cast members of television programmes such as Coronation Street, Dad's Army, Doctor Who and The Muppets, comedians such as Ken Dodd, Cannon and Ball, Les Dawson, Alan Carr, Keith Lemon and Peter Kay, musicians like George Formby, Lisa Stansfield, Status Quo, the Bee Gees, Westlife, Steps, Blue and Robbie Williams, sportsmen such as Stanley Matthews, Matt Busby, Gordon Banks, Frank Bruno and various Olympians, as well as members of royalty and nobility. In September 1977, Blackpool Illuminations were switched on by a horse! This was when Red Rum did the honours. He also opened The Steeplechase roller coaster in Blackpool Pleasure Beach that year. And he also won his third Grand National in April 1977. A busy year for the UK's best-known racehorse. The switching-on of Blackpool Illuminations in 2008 was the topic of an episode of BBC Two's Top Gear. In it, the programme's three presenters Jeremy Clarkson, Richard Hammond and James May each had to make it from Switzerland to Blackpool on one tank of fuel in time to turn on the lights. Jeremy Clarkson and Richard Hammond made their destination on time. However, while the two presenters argued over who should turn the lights on, The Stig beat them to it and hit the on switch. It takes 22 weeks to put the displays and lights up for Blackpool Illuminations and 14 weeks to take them down. This means that, although they are lit for 2 months a year, they are actually present for pretty much most of the year. Another feature of Blackpool Illuminations is Blackpool Tower, which is also lit up for the duration of the festival of lights. In 2007 a laser was installed on Blackpool Tower which could be seen from 30 miles away during the Blackpool Illuminations, much to the annoyance of astronomers.